Item # 307780 Stash Points: 2,199 (?) This is the number of points you get in The Zumiez Stash for purchasing this item. Stash points are redeemable for exclusive rewards only available to Zumiez Stash members. To redeem your points check out the rewards catalog on thestash.zumiez.com. 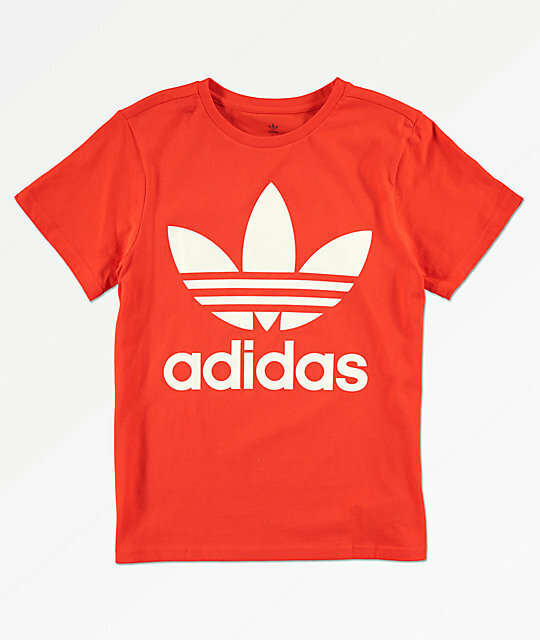 Get inspired by adidas' rich heritage by the all-new youth sized Trefoil Orange T-Shirt. Featured with the Euro-athletic brand's iconic Trefoil logo printed across the front in white, a nice contrast to the garment's overall orange colorway. Trefoil Orange T-Shirt from adidas. Screen printed adidas Trefoil logo graphic on chest and emblem on upper back. Machine wash cold deicate, tumble dry low. 26" (66cm) from shoulder to bottom hem on youth size Large.